St. Francis Xavier University’s leadership came from away—all the way from Antigonish—to Toronto this week and joined many of the university’s loyal alumni to celebrate the philanthropy of Gerry Schwartz, and his $5.3 million donation to StFX’s Gerald Schwartz School of Business—a gift which includes $4 million to create 44 new entrance scholarships and 20 new bursaries at the business school. The funding, to start in the 2019-20 academic year, will make an undergraduate business education at StFX even more accessible, and will help the Schwartz School—named in recognition of Mr. Schwartz’s already significant contributions to the university—attract the best and brightest young minds from across Canada and beyond. The Royal Alexandra Theatre in downtown Toronto provided the backdrop for the event and the stage where the award-winning Canadian musical, Come From Away, is playing. “First of all, I love StFX,” Mr. Schwartz, President and CEO or ONEX Corporation, told the crowd of about 100 StFX alumni, supporters and friends. 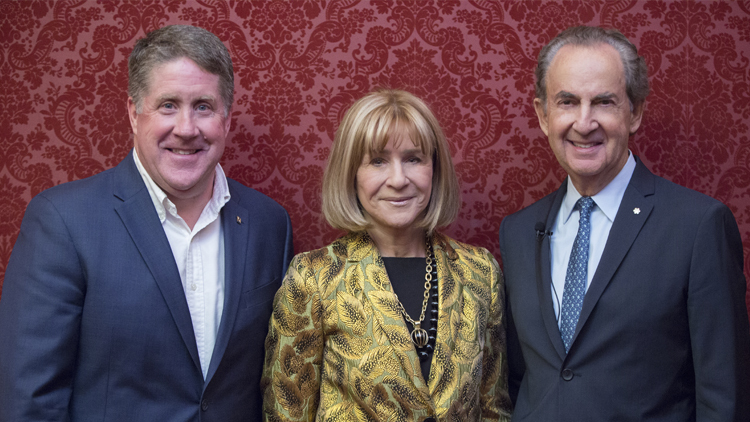 The $5.3 million gift, from The Gerald Schwartz & Heather Reisman Foundation, will allocate $4 million toward scholarships and bursaries for students enrolled in the business school, including the introduction of the Schwartz National Scholar award for four students, who will each receive $80,000 over four years to attend StFX. The new funding will also provide many other benefits, including bursaries for students in financial need, those looking for an international exchange experience and support for summer research internships. Academic scholarships will also be designated specifically for women, international students, and students transferring from college diploma programs. In addition, about $1.3 million of the gift is dedicated to supporting StFX’s marketing and recruitment work across Canada to encourage young people from all over the country to attend StFX. There are also opportunities for new scholarships in the business program that can be matched by some of the foundation’s gift. In addition to recognizing superior scholastic achievement, the new Schwartz School scholarships are intended to support well-rounded students who demonstrate StFX’s commitment to leadership and service to one’s community, Dr. Hynes says. 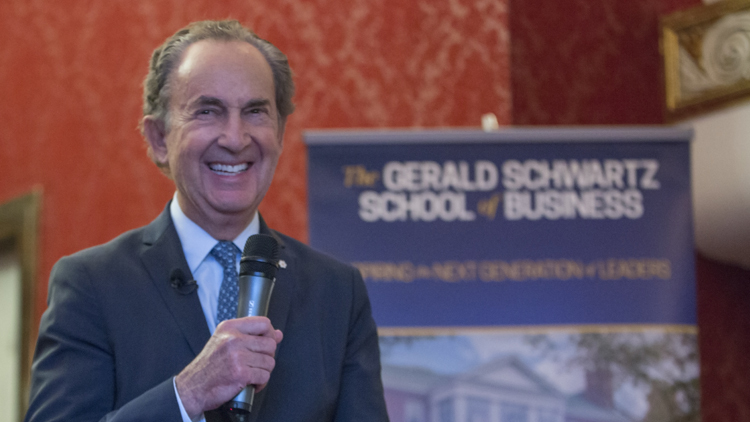 Known for its small class sizes, talented faculty, and an immersive, hands-on approach to learning, the Schwarz School of Business is recognized as one of the best undergraduate business schools in the country. Erica Harper, who was at the event, and who graduated from the Schwartz School of Business with a marketing degree in 2018, said StFX changed her life. It gave her confidence and she was able to find a job almost immediately upon graduating. “It’s such a special place,” she said. Lisa Downey agrees with that sentiment. She graduated with a business degree from the Schwartz School in 2017. Ms. Downey was able to get a job in her field after graduating – and in a matter of hours discovered her boss’ daughter attends StFX. • Schwartz National Scholars. StFX will offer annually four Schwartz National Scholars awards of $20,000 per year, renewable, for a total of $80,000 over four years. These awards are open to all first-year full-time BBA students who have a minimum 90 per cent average and demonstrated StFX qualities of leadership and service to community. The awards are open to all nationalities. • Order of Merit Entrance Awards. StFX will offer six Order of Merit Entrance Awards, of $7,500 per year, renewable for a total of $30,000 over four years. These awards will be open to first-year full-time BBA students enrolling from high school who are Canadian residents and have a minimum 90 per cent average and demonstrated StFX qualities of leadership and service to society. • Heather Reisman Women in Business Scholars. StFX will offer two Heather Reisman Women in Business Scholars awards, each renewal at $7,500 per year for a total of $30,000 over four years. These awards are open to first-year full-time female BBA students enrolling from high school. The awards are open to Canadian residents, with a minimum 90 per cent average and demonstrated StFX qualities of leadership and service to community. • Scholars of Distinction. StFX will offer 14 Schwartz Business Scholars of Distinction awards of $4,000 per year, renewable for a total of $16,000 over four years. The awards are open to first-year, full-time BBA students enrolling from high school with a minimum average of 85 per cent and demonstrated StFX qualities of leadership and service to community. The awards are open to Canadian residents. • International Scholars. StFX will offer 14 Schwartz School of Business International Scholars awards, each valued at $8,000 annually and renewable for a total of $32,000 over four years. These awards are open to all first-year, full-time BBA students enrolling from high school with a minimum average of 85 per cent and demonstrated StFX qualities of leadership and service to community. The awards are open to all non-Canadian residents. • Transfer Entrance Scholarships. StFX will offer four Transfer Entrance Scholarships of $3,000, each renewable for a total of $9,000 over three years. These awards will be open to students transferring full-time into the BBA program from the Nova Scotia Community College system or equivalent college in Canada with a minimum of 80 per cent average and no fewer than 24 credits in the past year of study. The scholarship is open to all Canadian residents. • The scholarship and bursary program will also offer annually eight International Exchange Travel Bursaries of $2,000 each; three Summer Research Internships of $7,000 each; one McKenna Fellowship valued at $33,000; and 10 Financial Need Bursaries of $2,000 each.